There is just one rule in the zombie mafia: Whack your enemies before they whack you. Fortunately, you’ve got a crew of Mooks to do your dirty work. Sure, they may be brainless, but they’re generally reliable. Just give them what they need and point them in the right direction. Of course, sometimes they forget what they’re doing, but that’s a small price to pay for undying loyalty, right? 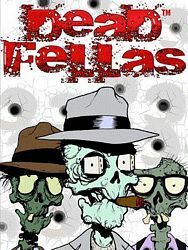 Deadfellas is a game about whacking guys in the zombie mafia. Each player uses his gang of Mooks to attack his opponents. In order to perform a hit, a Mook needs a disguise, a weapon, and a getaway vehicle. Equip all three item and your Mook can perform a hit on any enemy whose total strength is less than or equal to his own. A successful hit is not guaranteed, though, because an opponent can cancel a hit at any time by playing a "Fuhgeddaboutit!" card. After a successful hit, you have to discard a piece of evidence, reducing your Mook's strength and making him a target. So choose carefully. The winner of the game is the first player to rack up a body count worth 10 or more points.